The Head of Montgomery County's automated traffic enforcement division, Captain Tom Didone, has stated to WTOP that the unexplained "flashes" from the county's red light camera are because the devices are issuing "warning flashes". "Just because it flashes doesn't mean you're getting a photo." stated Didone to WTOP. This is a repeat of a claim made by Montgomery County to the press last year. many people have complained about the frequent flashes, arguing they distract driver and that they make people believe they are getting tickets when they are not. Didone says the flash is a warning light to let the camera know to get ready and let the driver know the light is about to change and to slow down immediately. "We don't believe it's a safety violation. It lets people know there is a camera there. There is an awareness factor. If the flash startles them and gets them to slow down and stop, that's a good thing," says Didone. The problem is that there is no such thing as a red light camera which issues "warning flashes". When a red light camera flashes, it is taking photos. Period. The flash has no purpose of warning the driver at all. The "Manual on Uniform Traffic Control Devices" contains no such thing as a traffic control device which issues "warning flashes" at traffic lights. And it would be stupid to have a device which does so. What purpose would it serve to issue a driver a "warning" after it is too late for them to safely stop? 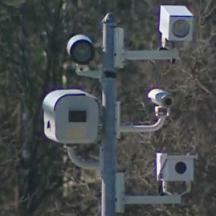 Red light cameras in Montgomery County record video starting about 3 seconds before the vehicle reaches the stop line. Obviously the devices are recording video and taking photos before the violation takes place or you could not have a video. The county would need to think the public is stupid not to realize this. In addition, we obtained a copy of the technical specification for this model of red light camera last year, and it contains absolutely no mention at all of "warning flashes". The real story behind these "warning flashes" is that last year the vendor for red light camera systems in Montgomery County and Rockville installed a new model which is far more sensitive, with the purpose of allowing them to issue tickets for "borderline violations" which the old cameras would not. Last year the City of Rockville deployed this model of cameras so that they could begin ticketing for slow moving right turns on red, something which a study by the NHTSA has shows is not a significant cause of accidents. As a result, the City of Rockville saw a VAST increase in the number of citations issued, and the profitability of their cameras. Now the large majority of red light camera tickets in Rockville are NOT going to straight-through red light runners, but rather to people who made right turns and do not believe they ran a red light at all. We still get LOTS of emails about this. Montgomery County sets a somewhat higher threshold for issuing tickets than Rockville, but they use the same model camera and they still occasionally issue right turn tickets (but at an apparently higher speed threshold than Rockville). So why did Montgomery County cook up this phoney "warning flash" story instead of simply admitting the truth straight up? "Yes, people do get their photos taken by red light cameras all the time when no violation takes place. You have no right to privacy in public. We can take as many photos of non-violators as we wish so that we can examine them after the fact and look for possible reasons to issue citations." Of course, the reason is because this conflicts with the county's narrative they use to reply to complaints that photo enforcement is a kind of "mass surveillance" by saying "If you don't run a red light/don't speed, you won't get your photo taken". Obviously that is not always true. And perhaps many think this is a trivial thing. If citations don't get issued, then so what? Well the reason you should care is that Montgomery County apparently can't give the public a straight answer about this for no better reason than they would prefer to tell the press a story which fits their narrative better. If that is the case, then what else are they lying to the public and the press about?